It’s pretty great being Nigel Farage. He’s already vastly wealthy from his career as an international banker, speculating on commodities that the lower orders dug out of the ground. And now he’s an MEP, giving him the opportunity to pocket three million quid or so in expenses while not actually showing up all that much. The media love him, he’s the toast of the lounge bar, and he never has to pay for a pint or a taxi. But in his quiet moments, perhaps alone in a Brussels hotel at four in the morning, there is a vision that haunts him. A spectre, a Frankenstein’s monster of all the worst things he can imagine. A feminist, socialist, vegan, African immigrant; a public-sector trade unionist; a – he holds his copy of According To Clarkson tight for comfort – a Scot. Nigel doesn’t know it yet, but this nightmare has a name. Her name is Maggie Chapman. Maggie, a South African citizen brought up in Harare, Zimbabwe, a university lecturer and EIS organiser, an Edinburgh City councillor, an unabashed socialist and the Scottish Greens’ co-convenor and European Parliament candidate, is the person with the opportunity to spoil Nigel’s big day. For UKIP, the European election on 22 May should be their finest hour. While the collapse of Liberal Democrat votes to Labour have dampened their hopes of winning the election outright, they will probably relegate the Conservatives to third place, exerting massive pressure on the government to pander to UKIP’s palaeoconservative agenda. In Scotland, though, they face a different symbolic challenge. UKIP has never won a single election in Scotland. No councilors, no MEP, certainly no MSP or MP. And it burns. You may think that UKIP don’t care about winning here, but Scotland’s refusal to join in the Farage lovefest is an existential threat to UKIP’s everybody-loves-us image. When your success is based upon a media consensus that everybody secretly agrees with you, the taciturn disapproval of a whole nation that apparently wouldn’t piss on you if you were on fire is distinctly inconvenient. So winning an MEP in Scotland is hugely important for UKIP. It’s their chance to show they can operate beyond The Wall, that their appeal is as universal as the media currently suggest. It’s their chance to silence the dissenting voice. To see how significant Scottish resistance to the far-right party is, one need only look at the coverage of Farage on tour before and after his visit to Scotland in May last year. Prior to his trip north (to campaign in the Donside by-election in which UKIP spent £19,000 and still lost their deposit) every Farage appearance featured smiling locals and a windowed pint of best British ale. No-one could have guessed from these photo opportunities that the UKIP leader wasn’t some kind of national treasure, a cross between Stephen Fry and Delia Smith. But after protestors organised by the Radical Independence Campaign ‘welcomed’ him to Scotland by kettling him inside Edinburgh’s Canon’s Gait pub (still a much more considerate place to be kettled than those the rest of us get at the hands of the boys in blue), suddenly there were voices of dissent everywhere. He even had to face protests in Kent of all places, his birthplace and his party’s spiritual home. It was an Emperor’s New Clothes moment. And if a UKIP victory in unconquerable Scotland is important to Farage, it’s even more important to the campaign against Scottish independence. Crucial to their campaign is the argument that Scotland is politically no different to the rest of the UK, that our apparent predilection for more progressive policies is nothing more than an illusion brought on by our lack of fiscal responsibilities, a symptom of our subsidy junkiehood. However much the No campaign distance themselves from UKIP, they know that a Farage triumph splashed across the front pages, identifying the UK as UKIP country, while Scotland remains resolutely unmoved, would be a crushing blow to that theory. It would prove that we have a different political culture, that we are more progressive. And it would prove that the Coalition government is not just a blip in history that will be swept away in a glorious One-Nation Labour landslide – rather the UK is a country that is marching rapidly to the right and far from what Scots consider a moderate politics. A UKIP seat in Scotland, on the other hand, will help the No campaign make their case that Scotland’s progressivism is all for show. That radical Scots should fear the hidden conservatism of their neighbours, which will creep out in the first election of an independent Scottish parliament and strangle our hopes for change. It would tell us what the No campaign need, above all, to tell us: there is no hope. A year after the Battle of the Canon’s Gait, on 22 May this year, Scots have a chance to continue our inconvenient resistance to the xenophobic, ultra-nationalist politics of UKIP, and to proudly proclaim our belief in change for the better. But we also face the biggest threat to our resolve. Scotland has not proved entirely immune to the bombardment of pro-UKIP messages in the British media, or to the plague-on-all-your-houses nihilism that suggests electing the unelectable might be the best way to express one’s anger. In YouGov’s first poll on the European elections, UKIP scored 26 per cent, a result which would push the Tories into third place for the first time in their history and more than double the number of UKIP MEPs to 23. In Scotland they took just 10 per cent, less than half their support in any other region. But enough to put them in the race for the sixth and final Scottish seat. With the Lib Dems collapsing – they polled at five per cent in Scotland – George Lyon’s seat is up for grabs and UKIP’s London branch chairman, David Coburn, has his sights set on it. Who can beat him to that seat? The feminist, environmentalist socialist from Harare, Maggie Chapman, is polling just one per cent behind UKIP. For the purely tactical voter, there are some fascinating but ultimately inconclusive maths to consider. We cannot know exactly where the votes will fall; to my mind it seems unlikely that Labour will romp to a 17-point lead over the SNP for example. But we can know this: UKIP will be heavily supported by the media (Ofcom just released guidelines ensuring that they’ll be treated as a ‘major party’ for UK-wide broadcasts) and have deep pockets. They will be in play. The Greens have never failed to increase vote share from one European election to the next, and are usually underestimated by early polls. The Lib Dems are collapsing everywhere and are unlikely to retain their seat. And, crucially, while both SNP and Labour will hope for a third seat, the tactical voter needs to remember that by the time we get to that count each SNP and Labour vote will have been reduced to a third of its value. If you’re just voting to keep UKIP out, you’ll need to cast three SNP or Labour votes to get the same stopping power as one Green vote. But for me this isn’t a purely tactical question, this is about two visions of Scotland, diametrically opposed. On the day the results are announced, we will be presented with a triumphant vision of Britain as seen from a Kentish lounge bar. A Britain of immigrants cowering as Home Office thugs kick in their doors, of welfare claimants destituted then arrested for cluttering the streets, of gays and lesbians turned away from segregated businesses, all presided over by the banker who became the most popular man in the land, and cheered along by forelock-tugging commoners, happy with their lot as long as they know they can always kick down. Will that vision extend to Scotland? Or will we have grabbed the opportunity to say we will not submit to hopelessness; we will not be driven apart, we will not accept that our best days are decades behind us? If in the aftermath of that election Scotland has elected Maggie Chapman, a Green, and rejected UKIP, we will have forced our own vision onto the scene. A vision of a Scotland of a war on inequality instead of on the poor, where austerity is thrown off in favour of making the rich pay for their own mess, where our brothers and sisters from around the world are welcomed, and our nation is known around the world as a voice for peace, a friendly refusenik to the NATO nuclear alliance. I know that struggle won’t be won overnight. But it won’t be won ever if we don’t take the field. If Maggie Chapman wins on 22 May, radicals will wake up with our banner flying high over Scotland. This article was first published in Scottish Left Review – republished by kind permission. Good write, the idea of UKIP in any sort of power fills me with dread ! Aye! “the taciturn disapproval of a whole nation that apparently wouldn’t piss on you if you were on fire is distinctly inconvenient.” So true. Maggie Chapman speaking in Grantown on Spey Friday 4th April Grant Arms Hotel 7:30, Fergus Ewing, Jean Urquhart, Cameron MacNeish, should be great debate. Can somebody video it and post it on YouTube? With the LibDems imploding, their seat is likely to be a fight between the SNP, Labour and Tories, more than the Greens. Hell, if you remove the LibDem votes from last time (which roughly simulates an even split among all other parties) then the SNP would be getting their seat, followed by the Tories before the Greens. And the most likely people to cast a vote against UKIP are SNP voters, or Old Labour voters. Also, we’re likely to be having a do-over for MEPs shortly after 2016, as we’ll get more of them. And I’d much rather everyone focus on getting there, than squabbling on the way. Because, lets face it, If we end up voting No, then we’ll need to put a united front up to Westminster, and the SNP are currently the best placed to head that front. 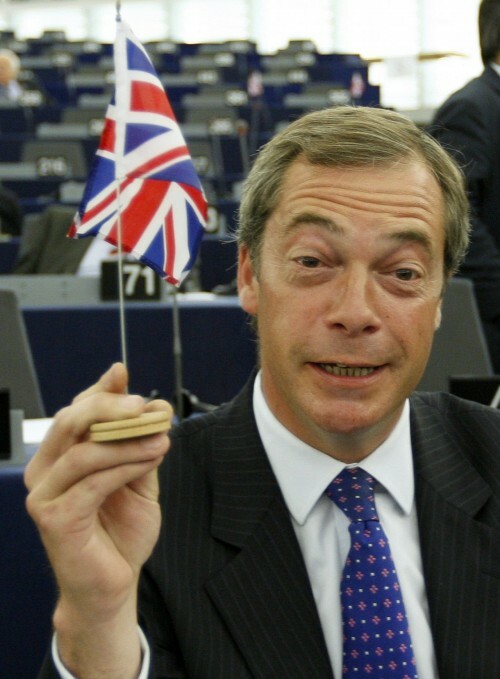 Three potent Symbols of Britain in concert; the Union Flag, the custard-cream and Nige. How can they possibly lose? I don’t think that there is any doubt that the LibDems will take a hit regardless of the record of George Lyon. I also think UKIP gaining an MEP in Scotland would be used exactly as the article says to demolish the case that there is any difference between Scotland and the rest of the country. That is why the media are interested. The story they are after is exactly that, that Scotland is in fact following the rest of the UK, nothing else makes a UKIP victory particularly news worthy. The blog Illy linked to assumes Scots are not going to be affected by negative attitudes to the EU on the back of what’s happening across Europe. It also assumes UKIP support in England comes primarily from disgruntled Tories, both of these assumptions are suspect. The evidence in England is that UKIP draws most of its support from working class voters many of whom are traditional Labour supporters and that East European immigration is a bigger reason why these people vote for UKIP. So the analysis on that blog is flawed, and it doesn’t conclusively prove anything. I also don’t understand the idea that a united front is best achieved by not voting for the Greens. There is no united front without Green representation, because who will the SNP MEPs be uniting with to fight for a vision of an independent Scotland without the Greens? All in all an the article provides an excellent analysis and I concur that people should consider tactically voting for the Greens. “UKIP’s palaeoconservative agenda”- superb. Great article very well written. Well nice piece of well written scaremongering. You will of course be aware that Farage told the Telegraph readers on live streaming that he believes in the right of self determination. If that is what the scots want they should have it and he would respect that. Doesn’t mean he would want it but he would not prevent it if he was in charge. Gay marraige is here to stay his concern is about the ECHR overiding UK law on faith group exemptions. In fifteen years as an MEP he never had one letter about Gay Marraige but did on Civil Partnerships which worked well. He said. You will be aware of course that UKIP advocates work permits and controlled border policy. Hardly new. The EU requires work permits for non EU citizens and no entitlement to benefits for five years. Ukip reciprocate s the EU position. It is also the position of non EU european countries like Switzerland.